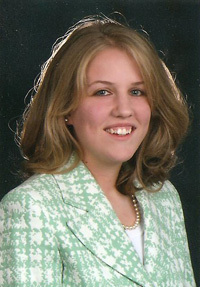 Our first FCSLA Youth Recognition Award goes to twenty year old Kathryn "Kate" Szymkiewicz. She lives in Natrona Hts., PA. with her parents and one brother, Tyler. Kate became a member of FCSLA in November of 1990, joining Junior Branch J-138. Kate started volunteering when she became a senior branch member and recently was elected a branch officer. Kate enjoys accepting responsibilities to help with branch activities. She attends her branch and district meetings faithfully. Kate's home parish is Our Lady of the Most Blessed Sacrament. As a member Kate was involved in parish liturgies and activities. She presently volunteers for many religious activities at a parish near her home, Our Lady of Victory. Kate is a kindergarten catchiest at Our Lady of Victory for their CCD Program and volunteers for their Vacation Bible School every summer. She assists this parish in a variety of the children's activities, such as Easter egg hunts, children's masses and holiday bingo get-togethers. Kate recently became employed at Our Lady of Victory as a part-time custodian. She is also employed at the Community Library of the Allegheny Valley where she assisted several years ago with their Summer Reading Program. Kate has always taken her education very seriously. During her high school years she was a member of the National Honor Society. Kate was also involved in many curricular and extracurricular activities at her high school. She is presently enrolled at the University of Pittsburgh pursuing a bachelor's degree in Economics where she maintains a 3.781 cumulative GPA. Kate is a member of the University of Pittsburgh's chapter of Sigma Alpha Lambda (a national leadership and honors organization). She is also a member of the University of Pittsburgh's chapter of Omicron Delta Epsilon, (an international honor society in the field of economics). These are only a few of the many accomplishments listed on her entry form. Kate is planning on pursuing her master's degree in Elementary Education. FCSLA congratulates Kate for being chosen as our first Youth Recognition Award winner. We are very proud that she is an active member of our association. FCSLA officers and members wish her a successful future.